A parody supplement of the New York Times criticizing the paper's coverage of Israel/Palestine is being handed out on the streets of New York City. This morning New York commuters are being treated to a surprise as they head to work. People have spread out across New York City handing out an expertly-produced “supplement” to today’s New York Times announcing a “new editorial policy” towards Israel/Palestine. The New York Times has decided to make several changes in our editorial policy with regard to coverage of events in Israel-Palestine. These changes are an attempt to address both realities on the ground and the concerns readers have expressed about fairness in our reporting. We are proud to bring you more trustworthy and fact-based coverage. We want to hear your thoughts. Explore our new Israel-Palestine supplement and tell us what you think. Write to us at [email protected]com or join the conversation on Twitter. New York Times supplement being distributed near the New York Time headquarters. Throughout its history, The New York Times has aimed to uphold the highest principles of fairness and accuracy in our news coverage. We take this very seriously. We now recognize this sense of fairness has been absent in our paper’s coverage of ongoing conditions in Israel and Palestine. Having met for the past several months with leaders of Palestinian and Jewish peace organizations, our editorial staff recognizes that accusations of bias in our coverage have been well-founded. For example, it has come to our attention that, during the period of September-October 2015, eighteen headlines depicted Palestinians, while none depicted Israelis, as instigators of violence. Our news stories referred to Palestinian violence 36 times and Israeli violence only twice. We used the word “terrorist” to describe Palestinians 42 times, but only once to describe an Israeli. In light of this reality, The Times editorial staff has decided to make several changes in our editorial policy with regard to coverage of events in Israel-Palestine. These changes are an attempt to address both realities on the ground and the concerns readers have expressed about fairness in our coverage. Some changes will regard substance. We will also be attentive to distortions of style and attribution. When reporting views of government and security officials, we will be careful to indicate when something is alleged or attributed rather than to convey it as known fact. In addition, we are aware that a disproportionate number of our news stories in the past year and a half have focused on Israeli government statements and positions or the views of Israeli Jewish citizens; only a small fraction have featured Palestinian speakers, whether officials and advocates or residents who experience the effects of Israeli policies in everyday life. When reporting on victims of violence, we have profiled and named Jewish Israelis more frequently than we have Palestinian victims. Beginning now, we will attempt to redress this and other imbalances. To this end, one of our immediate goals is to add correspondents from the region who are Palestinian, and to include reporters and authors of opinion pieces who are reflective of the communities they are covering or writing about. Check out the supplement’s website www.newyorktimes-ip.com to read the all articles. What a gas! complete with an ad for SKUNK-WASSER! Way to go, NYT-ip! Just too good! Nutanyahoo must’ve dodoo”d his depends when he read the new New York Times. Wish I had the money to send a copy to all Americans and can’t wait for the second edition. They should also do a UN newsletter edition…sure they could be most enlightening with that worthless US controlled entity too! Brilliant way to get noo yoirkers thinking. Will Schumer and Clinton et al be hiring the dersh to deny that they have changed their stance on Human rights and to sue the purveyors of this vile pro Palestinian propaganda aimed at the only Jewish and Democratic state in the universe . Will they all offer to fell ate any number of donkeys on SNL to once and for all put to rest any suggestion they are not totally committed to Israel and it,s need for security and peace in the face of 1.3 billion Mooslums in a sea of terrorism . I have to wonder how much is the NYT being paid to keep Palestine out of the news? It’s called cultural bias and hiring policies. Reporters know who gets hired, let go, promoted. They don’t have to be told how to report. The exact same problem exists at PBS and NPR. I challenge anyone to find a Washington Week in Review wrap that dealt with Israel/Palestine in a balanced way. The Newshour seldom reports “inconvenient” news. The practice is to hold back and maybe put events “in context” later. As long as this problem with our main media exists, it will be rare for a Member of Congress to speak on the level of funding, the laundering of American funds to build settlements or even the occupation itself. A large number of voters trust the NYT and public broadcasting to keep them informed. Information is key to a better future. This pressure on the NYT to shape up is a giant step in the right direction. Mr. Horowitz, do you know who paid for this? Who paid for this, you ask? You are right, “Tobyanne”! That “Independent” article sinks to a new low. You can hear the bottom scrape. There’s no such thing as bad publicity. Traction brings awareness; check the Independent’s comments. Did they have SNL writers, or is great satire just everywhere below the surface? Help (spoken softly/weakly)! Please help (getting louder/stronger)! Somebody, please help me (spoken very strongly/insistently/beseechingly)! FOR THE LOVE OF GOD (reaching a crescendo), WILL NO ONE RID ME OF THIS GODDAMN “RED, RED, ROBBIN COME BOB, BOB, BOBIN’ ALONG”? It’s been nearly a month since I heard it while watching Coppola’s 1974 film The Conversation (because it was soon to be deleted from Netflix streaming), and it has been ricocheting around my brain/mind ever since! It’s even worse than being unable to get an Abba tune out of your mind (as in Empire Falls), and that undoubtedly qualifies as a ‘living hell’. I can’t stand it much longer. I swear I can’t! And, I would hate to “go postal”. Even though it is often said that a person should not knock something unless the person has tried it. *A neighbor of Nicole Brown Simpson heard the “plaintive wail” of a dog starting around 10:20 on the night she was killed. P.S. Don’t blame me. I think I might have a bit of Aspergers. I would advise anyone who reads JLD’s comment: Do NOT click that link. FOR ALL YOU AFICIONADOS OF EARLY AUDIO RECORDINGS, THE VICTROLA (manufactured by the Victor Talking Machine Company, headquartered in Camden, New Jersey), THE GRAMOPHONE* (based in the United Kingdom), DEUTSCHE GRAMMOPHON, ETC. ■ Photo of 1910-era Gramophone: One of the sled dogs on the ill-fated British Antarctic Expedition of 1910-13, a/k/a the Terra Nova Expedition) listens to music coming from a gramophone. The expedition was led by Capt. Robert Falcon Scott (i.e., “Scott of the Antarctic”) for the greater glory of His Imperial and Royal Majesty George V (most especially by ensuring that the South Pole would first be reached by the English) , and to honour his beloved Britain and its glorious Empire. Long story short, When Scott and four companions reached the South Pole on January 17, 1912, they discovered that a Norwegian team led by Roald Amundsen had preceded them by 34 days. To add insult (actually, far worse) to injury, Scott’s entire party died on the return journey from the pole; with some of their bodies, journals, and photographs (perhaps including the one of a sled dog listening to their gramophone) being found by a search party eight months later. 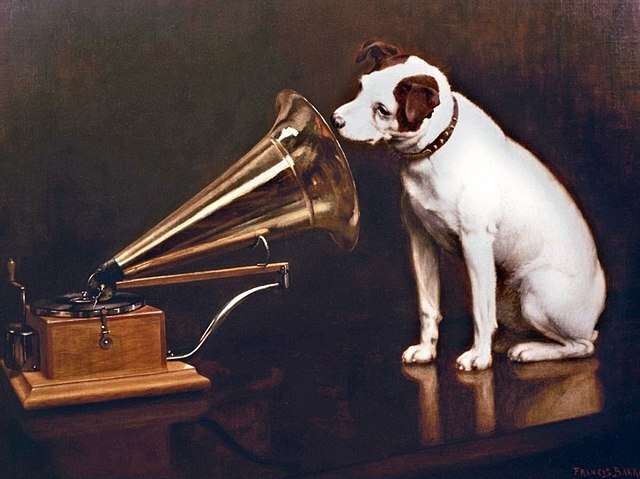 Nipper (1884–1895) was a dog who served as the model for a painting titled His Master’s Voice. This image was the basis for the dog-and-gramophone logo used by several audio recording and associated brand: Victor Talking Machine Company, Gramophone Company, Berliner Gramophone, His Master’s Voice, HMV, EMI, RCA, RCA Victor, Victrola, Electrola, Bluebird, Zonophone, JVC and Deutsche Grammophon. [EXCERPT] The Nipper Building is a colloquial name for The Victor condominiums, and formerly, Building 17, RCA Victor Company, Camden Plant. The structure is a historical building located in Cooper Grant neighborhood of Camden, Camden County, New Jersey, United States. 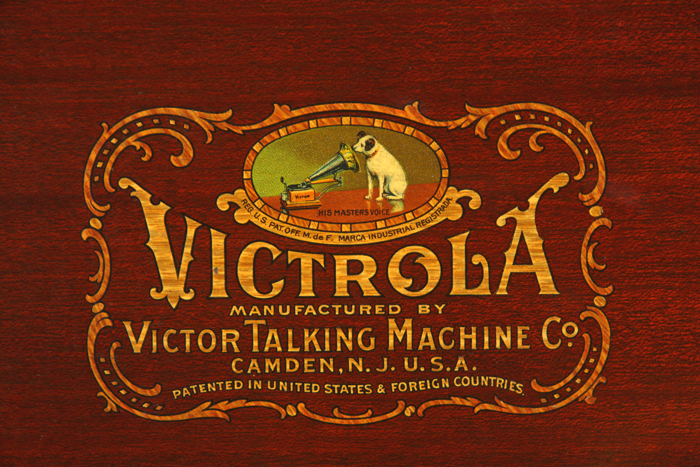 For many years Camden was the headquarters of the Victor Talking Machine Company, later RCA Victor. Originally a Victrola cabinet factory, the building was converted into luxury apartments and retail space in 2004. . . .
■ PHOTO: Stained glass window in the building’s tower featuring Nipper. Brilliant! I’m in awe of the talented writers. Of course, they did have good material to work with. Stealing intellectual property is so fun! …but not nearly as fun as terrorism, ethnic cleansing, occupation, colonization, torture, murder and sundry (war) crimes. I hear ya. If you can take a country you can take a joke. Zap! It’s gone because it VIOLATED COPYRIGHT. I’m sure they knew that. I’m sure they also figured they might be sued, but reckoned that was a risk worth taking since the NYT would have to wash and hang out to dry its dirty linen in public if they did sue. The fake NY Times belongs to the parody fair use category of trademark or copyrighted material..
To understand parody fair use versus satiric infringement, consider Taylor Swift’s “Bad Blood”. If I dub the video to parody Taylor Swift and change the lyric to “Drink Blood” or something similar, it would probably be fair use parody. If I took the same video to satirize US PTO misbehavior in favoring large corporations over individual inventors and dubbed “Bad Law” for “Bad Blood”, identified various US PTO officials as the bad guys, and modified the final scene to blow up a US PTO building, the result would probably infringe because pure satire generally is not fair use. fully functional too. it’s here to stay. and it got headlines internationally. And now they will have to give back all the money they made by violating NYTs copyright? No use-for-profit, no foul. Okay, the NYTs is going to sue them for blackening their name? Nope, the parody makes the NYTs look better. You know, about the only thing the NYTs could sue them for (ROTFLMSJAO) is false advertising. I bet the NYT’s circ. goes up! People will be hoping it’s changed for the better. Such publications are legally protected free speech upheld by the SCOTUS in Hustler v Fallwell. Then again, hasbara does have a record of trouble understanding democratic concepts like free speech, due process, right to not be killed based on one’s ethnic designation, so can’t blame much. BTW, “Hophmi” you old potential Supreme Court Justice, you, can you tell us specifically what “intellectual property” has been ‘stolen’? No i-p theft occurred. Parody and satire are fair use. Free speech is the number one enemy of zionists. “Stealing intellectual property is so fun!” hopknee. I did not know that lies and propaganda were considered intellectual property. Property, maybe — intellectual, not so much! Hophmi should incite the people who have falsely been reported as having become peaceful, reasonable and decent to sue immediately and establish in court that it is not true; that they remain their old criminal, murderous selves and that human decency is totally foreign to their nature. Hophmi’s is always the best counsel on PR. Hophmi should incite the people who have falsely reported as having become peaceful, reasonable and decent to sue immediately and establish in court that it is not true; that they remain their old criminal, murderous selves and that human decency is totally foreign to their nature. Hophmi’s is always the best counsel in PR. Acres and acres of it! Israel is a state of law and there are laws for transfering acres from Palestinians to the Jewish people. This is the sort of thing that can go viral. I hope there is an online version of this in the works. Perhaps a parody of certain news broadcasters on YouTube? This is laugh out loud funny, and sad at the same time. It’s sad because it highlights how America’s vaunted “free press” is being tyrannized into silence about a central factor in America’s most catastrophic and expensive foreign policy problem. And there’s no way America’s free press is being silenced by a relatively small bunch of Jewish religious extremists. No, there is Very Big Money behind those extremists, and the silencing of America’s establishment media. Oddly, most of those Very Big Money guys are not themselves religious extremists, and many claim they are not even religious at all. So what is their motive? They claim it is humanitarian, creating a “safe haven” (for Jews). But if they were truly motivated by humanitarian concerns would they support inflicting massive injustices on an innocent people? Of course not. So the humanitarian claim is not credible under examination. What then might be the motive? It’s said that more money is spent in a day of war than a year of peace. So war profits can be vast enough to easily buy up the major news outlets and politicians. And the next thing you know, we have the situation we’re in now. I hope there is an online version of this in the works. did you read the article or just look at the photos? and i recommend checking it out fast because it might not be online very long. great advertisements btw. Thanks Annie. I missed the link at the end. I just downloaded the image right away and enlarged it in the photo viewer to read. Excellent work! Where can I get a Copy of the printed item passed about? I want it for a platform file I am preparing for my faith community to expand awareness. But it is out there. Screen-shotted world-wide, for one thing. the onion its not. its focus on us/israeli policy will strike the majority of those subjected to the political ploy as nothing but more israel-hating, zionist-hating garbage. is it worth the few chuckles? maybe to some. more to others but mostly i imagine that at least 7500 are already in the waste bins of manhattan. Good, I’m glad you understand that as soon as Israel declared itself “the Jewish State” everything about Judaism, Jews and Jewishness became nothing more than political speech. And subject to the limits thereupon. Proof that Zionism is also incompatible with a sense of humor. So the fact that Israel gets billions in U.S. funds and you’ve stolen tens of thousands of acres of other people’s land and U.S. politicians pander to Israel is Israel-hating garbage instead of what it really is; the simple truth. So then you’re saying that those who love Israel suppress the truth, and exposing the truth is hating? Only in the upside down world of Zionism is the truth hateful. Your Zionism is worthless if it needs to surround itself with a wall of self-deception and gatekeepers of deception all over the western world. How long do you plan to keep up the charade that’s already transparent to the rest of mankind? Well said. kalithea! This spoof is in the finest, satirical traditions of “A Modest Proposal”, “Candide” and “Erehwon”. The Ziopaths don’t like it up `em, to borrow a catch-phrase from an old TV sit-com (“it” in the original being a cold, steel bayonet). The trumpeting of unrighteous indignation and howls of “anti-Semitism” are testament to its effectiveness. Whoever produced it gets high fives from me! So effective. Somewhere in a more evolved parallel universe where a media untouched by Zionism exists, and truth and justice reign supreme this is how their Times would report on the anomaly called Zionism. Woe is us – we got stuck with the inferior Times. Imagination appears to be your strong point. You imagine for example that anything and everything remotely critical of your beloved Land of Creation is anti semitic,Israel-hating,Zionist-hating etc. he’s not even really Jewish. The supplement website link doesn’t work. This parody was terrific — I read some of it on-line. The web-site was GONE this morning. I hope (and I am sure) that someone, somewhere made a copy of it. But I guess lawyers (and fear of lawyers) got in the way. I imagine some NYT folks hiding their copy inside a briefcase to read at home (but never in the office, oh no!). I imagine a second version of the thing: titled Not Your New York Times, each article says something like: Well, today was no different. Human rights for Palestinians did not achieve any new successes today, and things are as bleak as ever. Hillary Clinton did NOT say blah-blah, IDF generals did NOT say blah-blah, US Congress did NOT blah-blah. No totalitarian country could have exercised its censorship more effectively or quicker. USA, land of the free, home of the brave, and center of world’s speediest censorship. Must be doing something right! Bravo/Brava to all those involved in its production and distribution!! Can’t wait to see anti-Israel protesters selling limited copies of this now-out-of-print copyright violation for high prices on ebay. Do you want one that badly? In that case maybe someone can get you a laminated or framed copy for your home office before it appreciates! Can’t see the complete supplement. Someone has a working link? Also: wasn’t there an annual Bawl Street Journal? That was not for outsiders, an inside joke all the way. Talking about web sites. are the editors aware that to get the most recent comments one needs to sign in. when i don’t sign in the most recent comment is from 3 hours ago. after i sign in, the most recent comment is from a few minutes ago. When next you sign in, just tick the “Remember me” box, so you’ll be signed in until you next run clean-up software to get rid of cookies etc. Then, don’t assume it’s about you – comments are moderated and don’t necessarily appear in chronological order or in “real time”. This is the case at others sites I frequent, too. And it seems to be a relatively new development. Not sure if it’s due to the site software, or to a chance in how frequently pages are being cached by search engines. And did you know: it’s not, “I woke up this morning and I got myself a beer,” but, “I woke up this morning and I got myself a beard,” which I’m sure you’ll agree is a better line. Very funny, and highly useful. This was very cute, even just as daylight dreaming.